Life in tiny Lake Eden, Minnesota, is usually pleasantly uneventful. Lately, though, it seems everyone has more than their fair share of drama–especially the Swensen family. With so much on her plate, Hannah Swensen can hardly find the time to think about her bakery–let alone the town’s most recent murder. . . I just finished reading “Double Fudge Brownie Murder”book by Joanne Fluke and I have to say this book has so many good recipes in it, just wonderful! 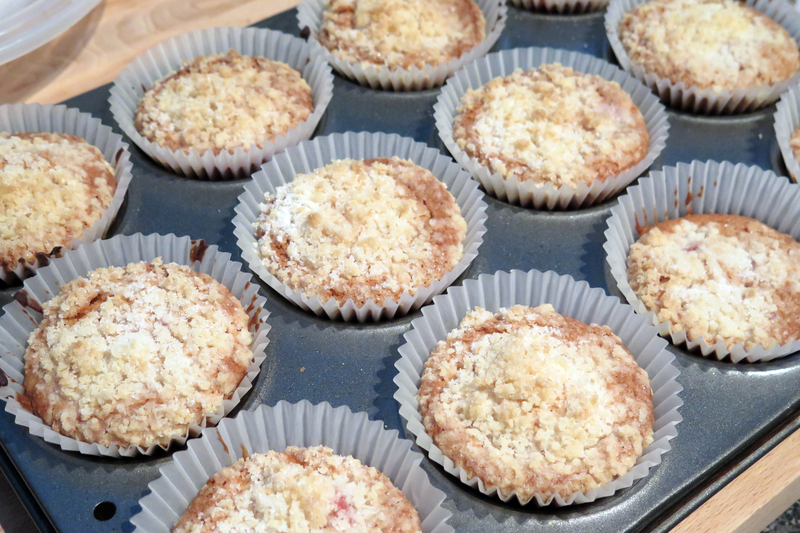 I was reading this book and when I was on a page 257 where the Strawberry muffin recipe was, I could no longer read, I had to go and bake these muffins, I just had to taste them 🙂 Funny – yes! 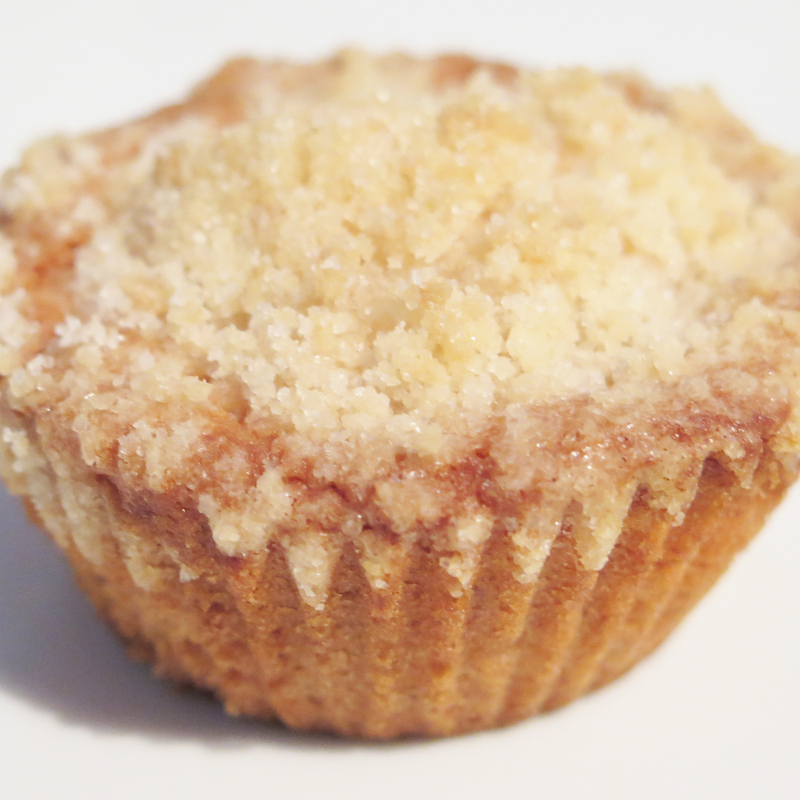 So let me share this incredible muffin recipe with you! Melt the butter. Mix in the sugar. Add the (beaten) eggs, baking powder, salt and cinnamon. Mix it all up thoroughly. 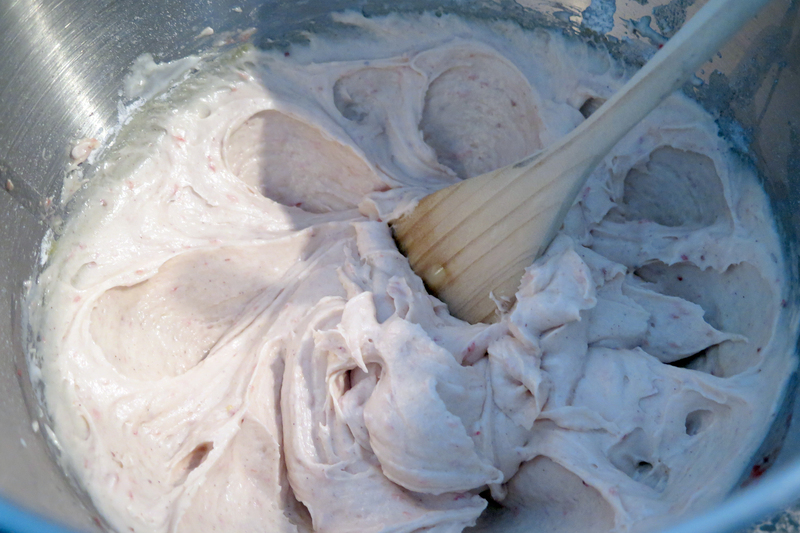 Put one tablespoon of flour in a baggie with your cup of frozen strawberries. Shake it gently to coat the strawberries and leave them in the bag for now. Add the remaining two cups of flour to your bowl and mix it in with the milk. Mix thoroughly. Now add the jam or pure. 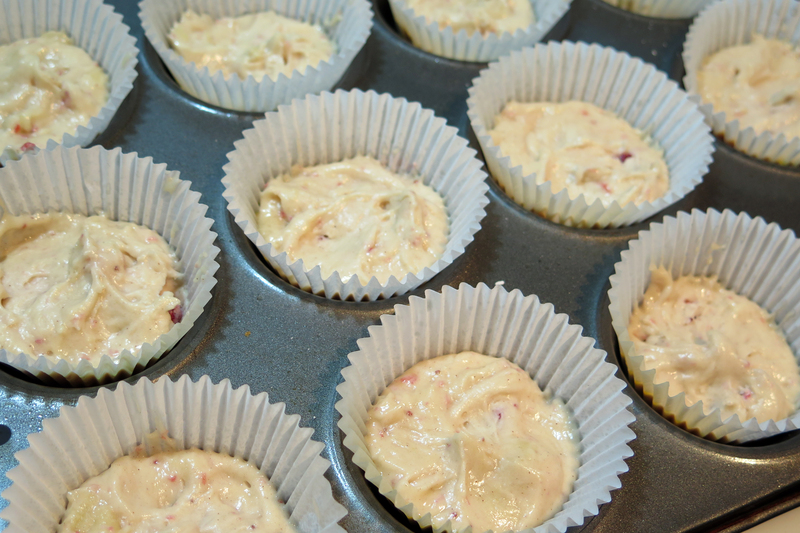 Grease the bottoms of a 12 cup muffin pan or line the cups with cupcake papers. Fill the muffin cups 3/4 full. Now I added the strawberries in the middle, about 2-3 slices in each muffin. Set aside. For the crumb topping mix the sugar and the flour in a bowl, cut he butter into little pieces and put everything in a food processor and process it till crumbly. 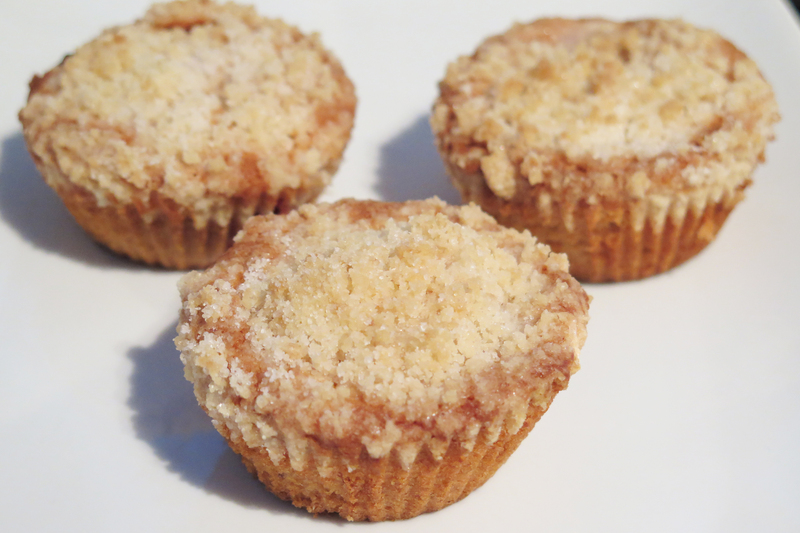 Fill the remaining space in the muffin cups with the crumb topping. Bake 375 degrees F for 25-30 minutes. I had them in the oven for 30 minutes. Set the muffin pan on a wire rack to cool for at least 30 minutes. Then just tip them out of the cups and enjoy. I was in a such a hurry to make them that I did not take a lot of pictures 🙂 When you have baked long enough you can almost taste it when you read the recipe but these muffins totally exceeded all my expectations! I can honestly say these are the best muffins I have ever made. And I have to confess I have never eaten 5 muffins at once but this time I did. I also made Orange Dreamsicle bar cookies this weekend and its beyond me how disappointed I was 😦 Tasted too floury. I think there is too much flour in that recipe. So much love and effort that I put into that recipe, I was so sad. I could not eat them. If you have baked the same cookie bars, let me know how you liked them, I would be grateful for the feedback! I love books with recipes, thanks for sharing yours! Your recipe seems to be copied wrong from the book. I made them with the 2 Tbsp. of baking powder like your recipe said and they were a disaster. Thought that was too much baking powder. Checked what the book called for on a Joanne Fluke facebook page and people said the book recipe was 2 tsp. That makes more sense. Just thought you might like to change that. Thank you Edith for letting me know. I’m so sorry your muffins were a disaster, too much baking powder will do that! Of course it is teaspoon, and to measure baking powder with a tablespoon makes no sense. You are absolutely right 😉 Thank you again! No problem. It is easy to copy wrong. Done it myself many times! I’m going to try these as a coffee cake. I love them as muffins but I don’t like so much crust and peeling papers. My first try didn’t go so well, but my oven runs hot. I’ve figured out how to set it for the right temperature and I will try this again when strawberries are in season again. I’m sad to hear that. These muffins are still in my top 5 list! Unfortunately with my gluten free diet I have been unable to bake them…. I did them gluten free using Domata Flour. They were wonderful! I use coconut milk (the drinkable kind in the 1/2 gallon carton) for the milk. Yum! I love Joanne Flukes’ books and recipes. Thank you so much for this post! This is the only muffin recipe I use now. I have adapted it — my son thinks the jam and crumb topping are overkill — so I don’t use them. The best part is that you can add any fruit, seed, nut, or baking chip to the mix and it’s delicious. I even use pulp from my son’s juicer use, and it is great! They are awesome! Thank you for reminding me Bonnie, have to bake them again! Lynn, I use coconut milk and coconut oil in the muffins also — wonderful!